Monday night at The Western pub saw a Leicester Shindig!-with-a-difference. In a change from the customary format, Jane Commane hosted an open-mic-only first half (with the usual bar-set-high readings, I must add). A Soundswrite Press showcase, hosted by Maria Taylor and compered by Karin Koller, comprised the second half of the evening. Karin opened with a few words about Soundswrite women’s poetry group. You can find out more here, but I’d like to add that I’m immensely grateful for the insightful feedback, support, friendship, open discussion and love of good poetry that characterises our twice-monthly meetings. It was good to see so many fellow Soundswriters in attendance and to hear them read a diverse selection of poems, many of which I remember first encountering as early drafts. 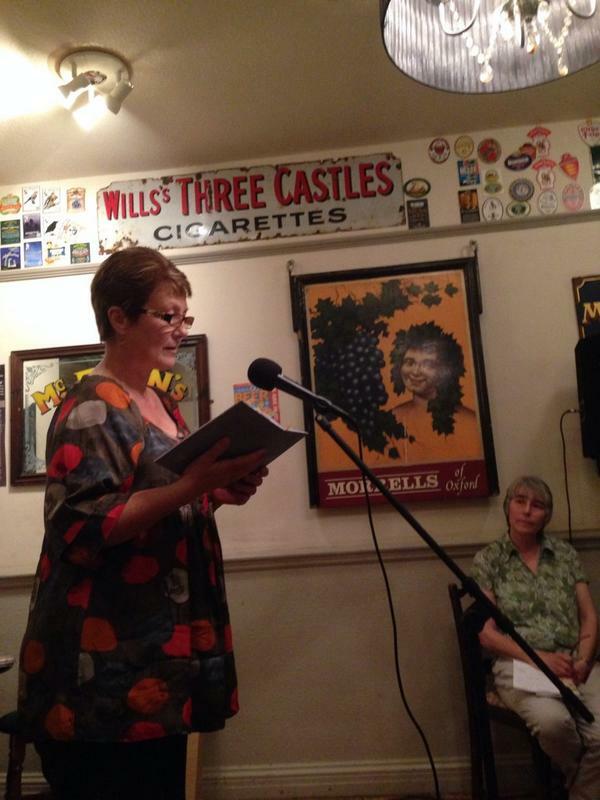 Caroline Cook co-featured with a reading of poems from her pamphlet, Primer, launched last March. For me, it was a nudge to re-visit my favourites in this primer-painted slim volume. The evening being a kind of pre-launch event, too, I co-featured with a reading from my debut pamphlet, Beyond the Tune (Soundswrite Press). As most of those gathered had workshopped many of its poems as early drafts and/or heard them at the open mic, I changed my mind several times when I was planning which ones to read on the night. In the end, I decided on a sort of journey through the pamphlet, reading eight of the twenty-seven poems by way of a thank you and as an invitation to the reader. And I also read a new poem (recently workshopped at Soundswrite) because there is a writing life after sending out a body of your own work into the world (although there were times when I did wonder). It was an evening filled with warmth and friendship as much as poetry. And wonderful to sign copies of my pamphlet, too! My thanks to those who came and to those who were there in spirit. It means a lot. I’m now looking forward to the launch proper on Saturday October 4th (post to follow). I’m thrilled that it’s to be a joint launch with D A Prince for her second full collection, Common Ground (HappenStance Press), not least because she has been my main editor (and oh so much more) over the past year or so. It’s a free event, open to all, as part of Leicester’s Everybody’s Reading festival, too. I’d love to say hi to you there if you’re able to make it. After yesterday’s ICT woes and various pleas for help via email and messaging (many thanks – you know who you are! ), to say nowt of the step-by-step (read idiot-proof) guide on WordPress Help, I’ve managed to get a Buy Now button functioning on this blog. So a signed copy of my little pamphlet (plus a bonus poem-on-a-postcard) is available to (ahem) buy now by clicking here, or you can buy direct from Soundswrite Press here. There are also the usual legal deposit copies in the Bodleian library in Oxford, Cambridge University, National Library of Scotland, Trinity College Dublin and National Library of Wales. (Imagine!) Or you could request a copy at your local library. This entry was posted in Blog and tagged Beyond the Tune, Common Ground, D A Prince, Happenstance Press, Leicester Shindig!, pamphlet launch, poetry pamphlet by jaynestanton. Bookmark the permalink.